If you’re flying American Airlines on Friday, there’s a chance that your pilot will be using an iPad instead of the traditional paper flight charts. 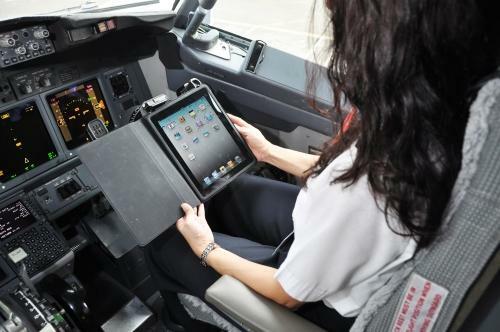 The airline has reportedly become the first major airline to get FAA approval to use the device. The switch will help American Airlines lose weight for the flight, thanks to the removal of massive books and other flight documents. For flights, weight equals money, so this is a big deal for airlines and it should be a great success. There is no news yet on what software the iPads will be running or how secure they will be with regards to what apps they will be allowed to run while on the plane. While some agree that the savings in fuel are worthwhile, others say that an iPad is more susceptible to malfunction, unlike paper. Although, the devices have undergone a six-month test period with thousands of hours of flight time, so you shouldn’t have to worry about any malfunctions with the device.